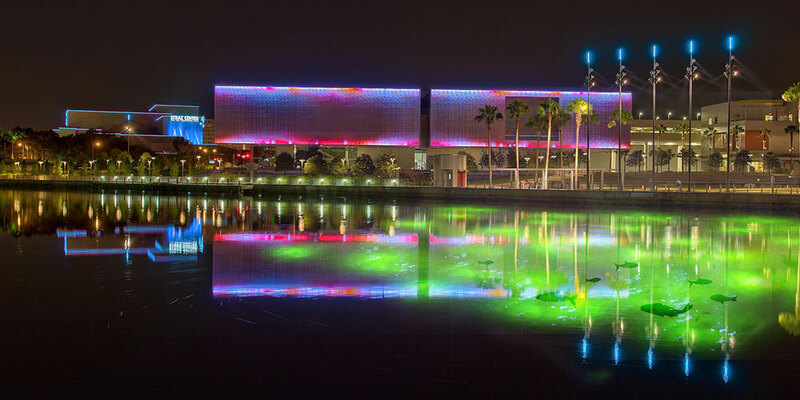 Tampa (Feb. 18, 2015) – Through its history, the festival has left behind permanent installations including the colors that flood the bridges crossing the Hillsborough River and the exterior of the Tampa Museum of Art. Riverglow will join the nightly light show that now is a signature of the downtown riverfront. The 50-by-120 foot installation was created by Wannemacher Jensen Architects of St. Petersburg. It is made up of about 95 lights, in a half-circle-shaped starburst, powered by conduits running along the river bottom 6 to 14 feet below the surface. “Depending on the tide, the experience and appearance will change due to the amount of water above the lights,” said Jason Jensen of Wannemacher Jensen. While tests were being run on the installation, crews saw fish as long as three feet swimming among the lights — creating a kind of semi-natural aquarium that the designers hope will serve as a learning experience as well as an artistic attraction. Video compilation of Lights On Tampa 2015 provided by Nicole Abbett via Vimeo.